Balkan Holidays’ local resort reps in Bulgaria are always on your disposal to make your summer holiday to Bulgaria more exciting and unforgettable. A wide range of excursions, daytrips, sightseeing trips are available locally. When on a summer holiday in the Varna region in Bulgaria, such as Golden Sands, our reps can arrange a lovely daytrip to the Dolphinarium in Varna. 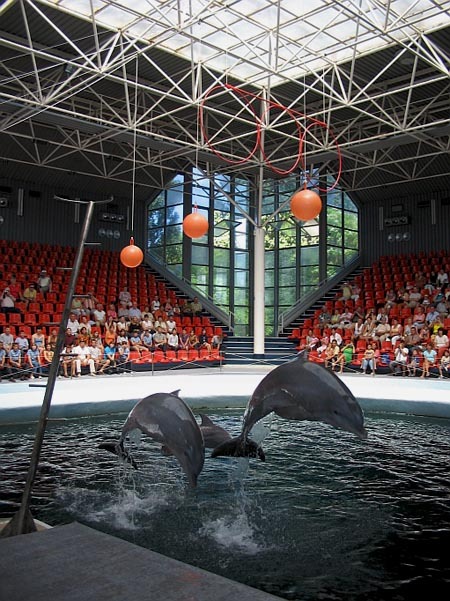 Varna Dolpinarium is situated in Primorski Park in Varna, and has 40 minute Dolphin Shows where sometimes clowns and actors perform together with the dolphinsa and spectators have the chance to help in feeding the dolphins. forbidden to use them for entertainment purposes. There are three Dolphin Shows daily from Tuesday to Sunday, the first one starts at 10:30, the last one at 15:30. The shows are conducted in four languages, including English. Fun day out for all the family.